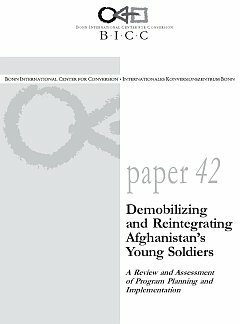 This report has been written to reflect some of the debates between different actors and partners involved in the process of demobilization and reintegration of former combatants in Afghanistan, and to examine the planning, coordination and early implementation of UNICEF’s program to demobilize and reintegrate war-affected young people within the overall framework of Afghanistan’s reconstruction process. While it is too early to measure the success and long-term impact of the program, significant weaknesses in program strategy, design and implementation can already be observed, which might hinder an effective and sustainable reintegration process. It is hoped that policymakers, international organizations, NGOs as well as donor governments may derive useful lessons from this assessment in formulating DD&R strategies and programs (in Afghanistan and elsewhere) for future engagement.